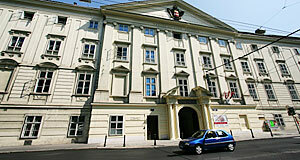 The Diplomatic Academy of Vienna is a graduate school of international studies in Vienna. As of 2009, I have the pleasure of being one of approximately 120 students at the academy, which puts me in the unique position to offer first-hand information on this institution. I am writing this article because prospective students of the Diplomatic Academy ended up on TourMyCountry.com coincidentally and e-mailed me questions about it when they saw in the "about"-section that I know the place. The Diplomatic Academy is situated in the Palais Favorita, a formerly Baroque and currently neo-Classical palace. Contrary to popular belief, the Diplomatic Academy itself is not a university – this is why it awards academic degrees only through collaborating institutions such as the University of Vienna or the Technical University of Vienna (TU). The Academy claims to be the oldest school of diplomacy and international relations in the world: It derives this claim from the "Orientalische Akademie", which was founded by Empress Maria Theresia in 1754 to foster the understanding of the Habsburg′s long-term nemesis, the Ottoman Empire. In the late 19th century, the Oriental Academy was re-organised in the course of educational reforms and became known as "Konsularakademie" for ongoing diplomats. As such, it survived the collapse of the Habsburg Empire and continued to offer diplomatic training until the Nazis closed the facility down. This is why the "oldest diplomatic academy in the world" claim gets highly dubious: Today′s Diplomatic Academy was in fact founded by Chancellor Bruno Kreisky in 1964. It was part of the Austrian Ministry of Foreign Affairs until a reorganisation in 1996; since then, it is partly funded and still associated with the ministry in various ways, but operates widely independently. Whilst the 1964 Diplomatic Academy concentrated on training for future civil servants, its scope has changed since the 1990ies. Today, the academy offers three programs: The traditional "Diplomlehrgang", a one year course that ends with the award of a diploma; it is well-recognised in the German-speaking world and often leads to a career in the Austrian civil service. For non-Austrians, it is important to keep in mind that the Diplomlehrgang is not equivalent to an academic degree. The "Master of Advanced International Studies" (MAIS) comprises of most of the contents of the Diplomlehrgang excluding subjects relevant only for Austrian civil servants (Austrian culture, history, diplomacy, some law, presentations), but with a less practical and more academic approach to international relations. It is a two-year master program that provides enough time for a part-time internship in the second year and ends with the award of an MA equivalent by the University of Vienna. The third and youngest program is my own: ETIA or "Environmental Technologies and International Affairs", which aims to train people with a degree in a science/engineering or "IR" subject (history, law, economics, etc.) in a variety of fields that link political and technical aspects of environmental protection and policy. ETIA is managed in close collaboration with the Technical University of Vienna, which does not only award the academic degree itself, but also provides most courses of the second year. The scope of all programs is to train people for a career with international organisations, the public or in the private sector. The somewhat misleading name of the "diplomatic" academy does not mean that all graduates become diplomats – in fact, even before the shift towards more academic curricula, only about 10 percent of the graduates actually joined the foreign service. This number is likely to decrease in the years to come. In terms of its organisation, the Diplomatic Academy of Vienna has four pillars: International Law, International Relations, History and Economics. In addition, there are plenty of language courses and especially the staff of the French courses act as if they were a fifth pillar (they are not, not even remotely). I would consider the language courses as "soft skill" training, together with etiquette, communication and negotiation skills, IT and other soft skill courses that are offered by the Diplomatic Academy. Except for the languages, students cannot earn credits through these courses. In terms of my attitude towards the Diplomatic Academy: I found the environment very friendly, refreshingly international (the language of instruction is English, most students are not Austrian) and very stimulating. I consider the courses generally demanding and I am very pleased with the learning curve the courses allowed me to undergo; however, there are strong disparities in the quality of teaching. All "Domestic" professors of the Diplomatic Academy are generally very competent and excellent teachers. The same thing can be said about the teachers that are recruited from the Johns Hopkins School of Advanced International Studies in Bologna, with which the Diplomatic Academy has a long-standing collaboration. Other professors from US universities are also generally highly recommendable. Update late 2009: In this paragraph, I formerly criticised the law courses thought by professors from Austrian public universities at the Diplomatic Academy rather harshly, since I experienced them as being of insufficient quality in the academic year of 2008/09. In response to this, the new administration of the DA contacted me to explain that measures were taken to improve this situation; staff has been exchanged and the new directorate appears to be very interested in meeting criticism with active attempts to change things for the good. The administration of the Diplomatic Academy is friendly and open to suggestions from students. The facilities are simple, but generally sufficient (computer labs are perfectly fine, the equipment and size of lecture theatres as well; the library is not very big and owned / operated by the ministry). Housing is available for about a third of the students during term at a competitive rate, there are basic sport facilities and a swimming pool available at certain times (provided by the neighbouring boarding school Theresianum). The food at the academy is excellent.